The Ecology and Institutional Services Section protects the health and safety of city residents through routine inspections and complaint investigations. The bureau inspects schools, swimming pools, tattoo facilities, daycare centers, group homes, assisted living facilities, adoption homes and foster care homes. It also investigates noise and odor complaints, sewage overflows, and assists in investigating vectorborne and waterborne disease outbreaks. How Do I Apply for a Tattoo License? How Do I Request a Health Department Inspection? How Do I Request an Environmental Site Assessment? How Do I Apply for a Temporary Noise Exemption Permit? All complaints regarding ecology or institutional services issues can be reported by calling 311 or by accessing the Baltimore CitiTrack Service Request System online. Each hauler truck must have a current license. Bring the registration form for each truck to the Ecology and Institutional Services Section at 1001 East Fayette Street, Baltimore MD 21202. Pay the required fee at our customer service counter: $100 for each truck over 7000 lbs., $35 for each truck 7000 lbs. and under. Note: Licenses must be renewed every year. Visit the plan examiner’s office, located at 417 E. Fayette St., to submit blue prints. Apply for a use and occupancy permit at the Department of Planning, also located at 417 E. Fayette Street. Contact the health department’s Bureau of Ecology to schedule an initial inspection. Submit completed Virginia Grame Baker Act Compliance form. Note: This only has to be submitted once unless changes have been made to the pool, pump or anti-entrapment drain covers. Submit completed ADA Affidavit. Swimming pool and spa applicants must submit an affadavit to document compliance with 2010 ADA Standards for Accessible Design; permits will not be issued without one. 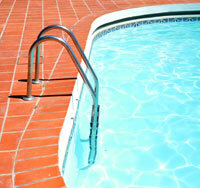 Pools generally will be inspected by the Bureau of Ecology after the license is issued. However, for public school and Department of Recreation and Parks pools, pools must be inspected prior to the license issuance. The Department of Planning, located at 417 E. Fayette Street, must approve a new tattoo business. Upon zoning board approval, apply for a use and occupancy permit at the Department of Planning, also located at 417 E. Fayette Street. Schedule a health department inspection with the Bureau of Ecology. 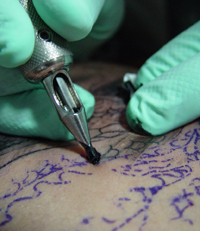 Upon approval of a health department inspection, complete theTattoo License Application, which includes registering all tattoo artists who will be practicing at the location. Bring completed application and appropriate fee ($100 for a one year or temporary license) to the customer service counter at 1001 East Fayette Street, Baltimore MD 21202. For new facilities other than adoptions and foster care, applicants must include a receipt for a use & occupancy permit. 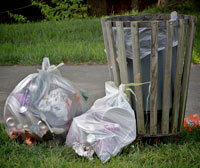 Complete environmental health inspection application. Application must be completed and signed. $150 fee must be paid for all applicants except FDC and DCC. Once the application is received, allow 7-10 days for processing. The applicant will receive a call from a sanitarian to schedule an inspection during this time. If a sanitarian has not been in contact with the applicant by the 10th day, please call the office between 8:30 a.m.–9:30 a.m. or 3:00 p.m.–4:00 p.m. Please do not call before the 10th day unless you are returning a call. The applicant will be given 7 days to correct any items. Once items are corrected, the applicant must contact the sanitarian to schedule a re-inspection. If a second re-inspection is needed the applicant must pay a fee of $50 prior to the re-inspection. If the sanitarian does not hear from the applicant within 3 weeks of the initial inspection, a courtesy phone call will be made to determine the status of the applicant’s corrections. If the sanitarian does not hear from the applicant or if a re-inspection has not been scheduled within 5 weeks of the initial inspection a letter will be mailed to the applicant requesting them to contact the sanitarian to schedule the re-inspection. If the sanitarian does not hear from the applicant or if a re-inspection has not been scheduled within 7 weeks of the initial inspection, a second and final notice will be mailed to the applicant to contact the sanitarian within 7 days. Failure to contact the sanitarian will result in the application being disapproved. The approved or disapproved application is processed within 3 business days. U&O will be signed off, if applicable, and the licensing agency will be notified by mail and a copy of the inspection report will be included. Upon receipt of a Maryland Public Information Act (PIA) request, the Baltimore City Health Department (BCHD) will provide investigation reports for a property should it have any on record. (Applicable service and copy fees will be applied). A property’s environmental history, however, is not under the purview of BCHD. The Maryland Department of Environment (MDE) is the regulatory and lead agency for such information. Requestors should file a PIA request directly with MDE for information pertaining to underground or aboveground storage tanks, chemical spills or releases, hazardous material storage or spills, soil contamination, ground water quality, surface water quality, etc.